The Arts Council of Northern Ireland, in association with the Golden Thread Gallery is delighted to announce the opening of visual arts exhibition, Drawing a Line – A Contemporary Survey of Art from Northern Ireland as part of the Harbin Winter Cultural Festival at the Museum of the Heilongjiang Daily in China on 18 march. Last year, an exhibition of paintings from Heilongjiang, entitled Black Dragon River opened at the Ormeau Baths Gallery, Belfast which provided insight into Heilongjiang, its artists, environment and heritage. Now, as part of a two way cultural exchange, China has the opportunity to gain an appreciation of Northern Ireland’s regeneration in this diverse exhibition. 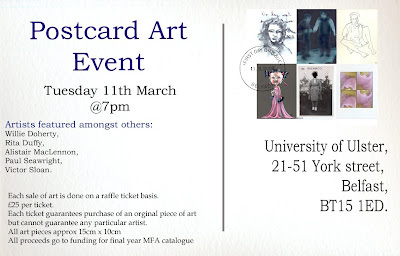 Participating artists are: Ian Charlesworth, Victor Sloan, Carbon Design, Alastair MacLennan, Martina Corry, Alex Knox, Susan McWilliams, Lisa Malone, Dan Shipsides, Charles Walsh, Una Walker, Colin Darke. Artists: Robert Ballagh, Rita Duffy, T.P. Flanagan, Paul Graham, Paul Henry, Seán Keating, Sir John Lavery, F.E. McWilliam, Sir William Orpen, Michael Power-O’Malley, Dermot Seymour, Victor Sloan, and Jack B.Yeats, alongside archive materials from Gael Linn, the Imperial War Museum, the Linen Hall Library, the National Library of Ireland and UTV. Curated by Professor Dermot Keogh and Ruth Osborne, An Eye for an Eye: Representations of Conflict in 20th Century Ireland employs art as an historical source to explore and reflect upon moments of conflict from throughout the twentieth century in Ireland. The title is evocative of how conflict has continually been played out in Irish history and the exhibition seeks to challenge the viewer by inviting them to reconsider moments of conflict beyond the binary of right verses wrong. An Eye for an Eye chronologically traces developments in Irish history by including artists who have visually represented events such as the rise of revolutionary and constitutional nationalism, partition and state building, to the years of violent conflict beginning in the late 1960s and known as the ‘Troubles’. Irish artists have left strong images in response to these events. Yet none of the artists in the exhibition gratuitously extol violence. Nor are any of the artworks propagandist in nature. 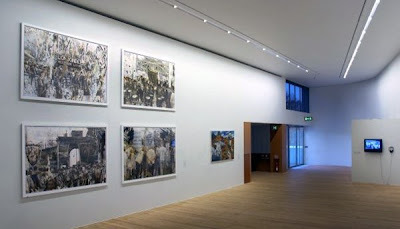 Rather the artworks suggest alternative responses and relationships to conflict in Ireland; from Jack Yeats’ personal and introspective Going to Wolfe Tone's Grave and Sir John Lavery’s grand Pro-Cathedral Dublin (Michael Collins), which addresses the aftermath of conflict on the scale of national mourning, to TP Flanagan’s poignant The Victim a highly personal work, universal and local in its significance, which tells the story of innocent, civilian death as a result of conflict. The exhibition seeks to offer moments of twentieth century Irish history to the viewer for examination, contemplation and even revision. The artworks have been chosen to encourage reflection on a complex period of history. By presenting images of quality and importance, which provoke a questioning of presuppositions or received views the exhibition is an invitation to reflect on the complexities of the past rather than a formula which seeks or offers answers. Professor Dermot Keogh is the Head of the History Department at University College Cork and has published widely on Irish social, cultural and political history and has conducted extensive research on the former Taoiseach Jack Lynch. THE Glucksman Gallery at UCC has maintained a strategy of running two divergent but related exhibitions in tandem, and such is the case with their current pairing of 'Getting Even' and 'An Eye for an Eye'. The latter, long anticipated, bears the helpfully explanatory subtitle 'Representations of Conflict in 20th Century Ireland', and is a hybrid combining fine art with apposite historical documentation. It is also, given this huge agenda, quite a sparse show, compact and visitor-friendly, though a little advance planning might be in order if you intend to stay for the entire length of George Morrison’s archival treasure trove of a documentary, 'Mise Éire', which is running continuously. In Ireland, as elsewhere, there was no shortage of conflicts begging for representation in the 20th century. Interestingly, though, the first piece we encounter is a drawing made by Sir William Orpen while working as an official war artist during the first World War. It’s a matter-of-fact study of a tired Royal Irish Fusilier, dated May 21st, 1917, and it’s here as a pointed reminder of the substantial and costly involvement of Irishmen in the conflict, an involvement that was, until quite recently, rarely or grudgingly acknowledged. While Irishmen were fighting and dying on the Western Front, quite another west is evoked in Seán Keating’s Men of the West, painted in 1915. In fact, this symbolic account of hardy West of Ireland men, armed and ready to join battle in the nationalist cause, also recalls the American Wild West with its stylised theatricality. Thereafter we see Sir John Lavery’s formal painting of the funeral of Michael Collins, Jack B Yeats on the annual Wolfe Tone commemoration and emblematic images of the West of Ireland, before moving on to more recent strife in Northern Ireland. The Troubles are reflected through Robert Ballagh’s response to the murder of members of the Miami Showband in 1975, one of FE McWilliam’s Women of Belfast bronzes, of individuals caught up in bomb blasts, and TP Flanagan’s dignified memorial to a slain friend. Paul Graham’s photographs subtly illustrate the way divisions and allegiances are inscribed on the landscape. The outstanding work, though, is Victor Sloan’s tremendous quartet of images of Orange Order July 12th parades. They could almost be celebratory, but the surfaces are scarred and torn, indicative of a corrosive historical legacy. 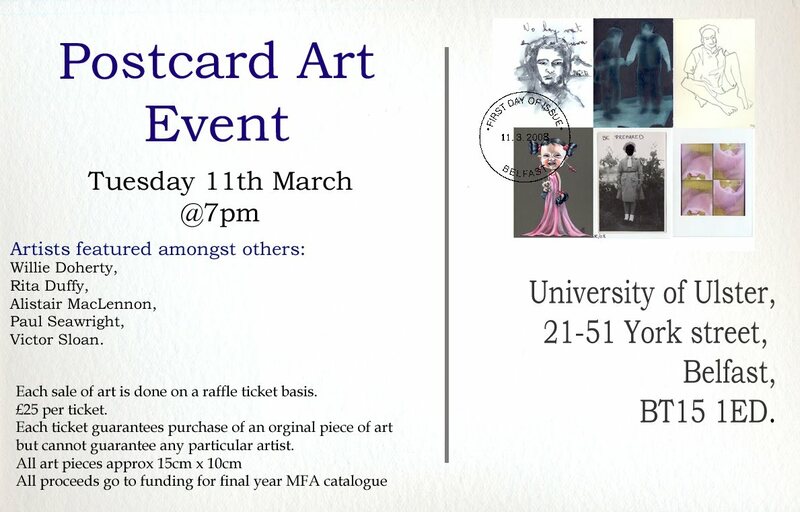 Print Draw: A draw will be held for each framed photograph. So simply visit the exhibition or our 30 webgallery at (link available here from Friday 21st November), select the print you want to win, buy a ticket and come to the Draw Event where the winners will be announced. 30 Grand Draw: Following the 50 individual draws, all tickets are entered into our Grand Draw for superb framed photographic prints by Anthony Haughey, Jackie Nickerson and Harry Thuillier Jnr. These prints represent the perfect starter collection for anyone with an interest in contemporary photography. 30 Exhibition Launch: 21st November, 8pm. 30 Print Draw Event: 22nd December, 8pm. 30 Ticket Price: each or for 4. Artists who have generously donated their prints are: Ciaran Óg Arnold, Eve Arnold, Emmet Bergin, Liam Blake, Michael Boran, Fergus Bourke, Noel Bowler, Martin Cregg, Mark Curran, John T. Davis, Daniel De Chenu, Tadhg Devlin, Bill Doyle, John Duncan, Michael Durand, David Farrell, Martine Franck, John Gerrard, Bruce Gilden, Karl Grimes, Anthony Haughey, Seán Hillen, Chris Killip, Clare Langan, Michael Lavelle, Sean Lynch, John Minihan, Suzanne Mooney, Trish Morrissey, Pádraig Murphy, Tony Murray, Jackie Nickerson, Deirdre O’Callaghan, Eoin O’Conaill, Kevin O’Farrell, Mick O’Kelly, Mandy O’Neill, Tony O’Shea, Martin Parr, Anna Rackard, Paul Seawright, Victor Sloan, Pete Smyth, Derek Speirs, Amelia Stein, David Stephenson, Joe Sterling, Harry Thuillier Jnr, Peter Thursfield & Rod Tuach. All proceeds go towards building The Light Room – our rooftop development. This new level will provide a state-of-the-art Digital Studio / public access workshop space. It will be launched in September 2009. Tickets on sale from the Gallery of Photography and also online using Paypal: visit http://www.galleryofphotography.ie/ for details. Gallery of Photography is supported by the Arts Council and Dublin City Council. The Light Room development is part funded by the Department of Arts, Sport and Tourism under the Access II Scheme. The Gallery, Bookshop & Darkrooms are open Tuesdays through Saturdays, 11am - 6pm Sundays, 1-6pm. 11 Nov - 13 December 2008. It is fitting that the very first exhibition in the recently re-opened Royal Hibernian Academy will be the 178th RHA Annual exhibition. There are 536 artworks in this year’s exhibition, with 73 invited artists and 300 works selected from this year’s open submission section-making it the largest open submission. The prize fund for this year’s exhibition totals 75,500 euro with 20 awards in total. The In Memoriam part of the exhibition will feature work by Conor Fallon HRHA, Raymond Piper HRHA and Raymond Mintz HRHA. The Academy would like to thank each artist that took the time and care to submit to the 178th RHA Annual Exhibition, to the RHA Selection Committee and to the technical crew who work to hang the exhibition. A special word of thanks goes to Liam Belton RHA who so generously gives of his time each year to hang the exhibition and Carolyn Mulholland RHA for placing sculpture. Visitors to the galleries can now enjoy a superb new café on the ground floor run by the Unicorn Café and a specialist art bookshop managed by Noble & Beggarman. We also have greatly extended our opening hours – we will now be open 7 days per week: Mon – Sat 11 am – 7 pm and Sundays from 2 – 5 pm. Sunday 9 November 2pm to 5pm RHA Friends, Exhibiting Artists and their guests. Monday 10 November 4pm to 9pm Artists and invited public. A Shout in the Street is the fifth in the series of the Golden Thread Gallery's Collective Histories of Northern Irish Art and features of contemporary and historical paintings, sculpture, lens based media, a bonfire stack, graphics and broadcast film made about, and in response to, the Northern Ireland context. Through this instalment, internationally renowned curator Declan McGonagle invites the viewer to consider the works in the exhibition "as moments of anxiety, in a dialogue between what is validated as art and what is not, between what comes from the gallery and returns to it, and what comes from the beyond the gallery – from the street and from the media". A Shout in the Street features materials from a wide variety of sources including the Cain Archive and works by mural painters Danny Devenny and Mark Ervine alongside works by a range of artists including Alastair MacLennan, Sandra Johnston, Factotum, Colin Middleton and Philip Napier. The Collective Histories of Northern Irish Art project embraces the overlapping and sometimes contradicting versions of history, from 1945 to the present, so as to create a much-needed historical context from which audiences can engage with contemporary practice. It is not an attempt to create one history: central to the project is an acknowledgment that there are many versions of history. A Shout in the Street will be launched on Friday 19th September between 6pm and 8pm. The exhibition will run until 6th November 2008. Artists/contributors: John Byrne; the Cain Archive; John Carson and Conor Kelly; Danny Devenny and Mark Ervine; John Duncan; Factotum; Gareth Humphreys; Sandra Johnston; Alastair MacLennan; Colin Middleton; Locky Morris; Philip Napier; Aisling O’Beirn; Daniel O’Neill and Victor Sloan. North By Northwest -The Life And Work Of Liam McCormick, curated by Shane O'Toole will be launched on Friday 26th September in the Project Space and runs until 23rd October 2008. Opening Hours: Tuesdays to Fridays - 10.30am to 5.30pm and Saturdays - 1pm - 4pm. Please note that we are also open till 9pm on the first Thursdays of each month as part of Belfast City Council's First Thursdays initiative. The 127th Annual Royal Ulster Academy Exhibition will be held in the historic Titanic Drawing Offices of Harland and Wolff Shipyard, Belfast. From 19 September– 19 October, the doors to this majestic building will be open to the public allowing them access for the first time to a very special part of Northern Ireland’s industrial heritage. Within these vast vaulted spaces, the RUA will exhibit works of leading and emerging local and international artists, and offer the public a rare opportunity to interact with the space through workshops, talks and tours. RUA President Rita Duffy said “The Titanic Drawing Offices have been transformed into a major gallery for the 127th RUA Exhibition. This is our effort to foster a respect for the visual, and generate a really vibrant exhibition that engages and develops the important relationships needed to create enthusiastic patrons and participants in ambitious artistic projects”. With support from KPMG, Arts& Business and the Arts Council, the RUA have developed an education strand running in tandem with the exhibition. 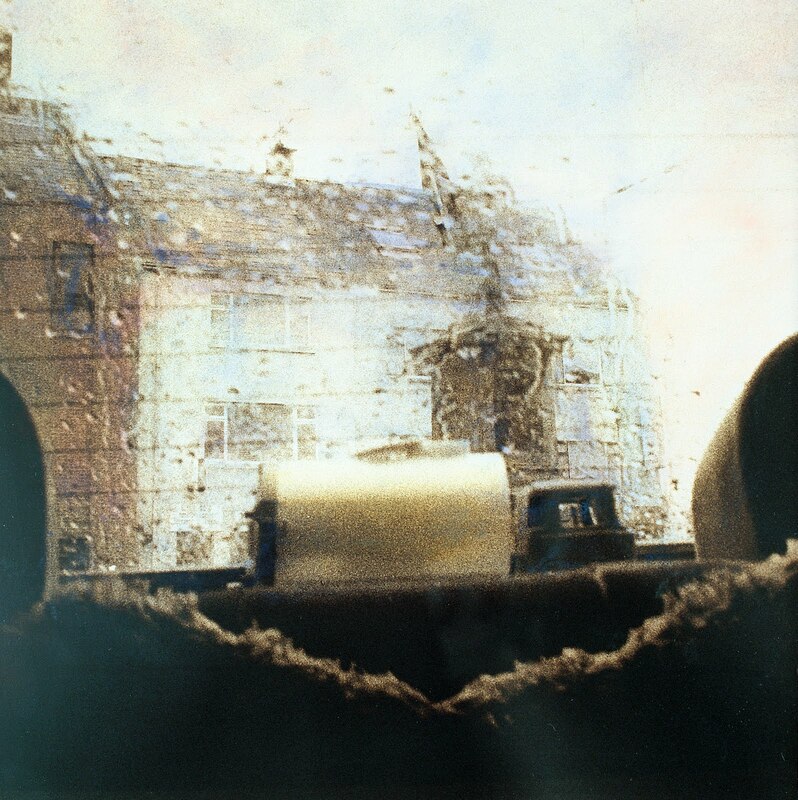 This includes talks by artists such as Paul Seawright and Susan MacWilliam, as well as workshops for children, family days and screenings in association with the Northern Ireland Film Archive. Academicians: Sophie Aghajanian, James Allen, Margaret Arthur, Brian Ballard, Basil Blackshaw, Richard Croft, Colin Davidson, Rita Duffy, Jean Duncan, TP Flanagan, Graham Gingles, Helen Kerr, R T Killen, Robert D Lee-Wade, Cecil Maguire, Elizabeth McEwen, Catherine McWilliams, Joseph McWilliams, Simon McWilliams, Jack Pakenham, Neil Shawcross, Bob Sloan, Victor Sloan MBE, Norman Smyth. Associate Academicians: Barbara Allen, Anne M. Anderson, Betty Brown, Beatrice Chapleo, Joy Clements, Ivor Coburn, Chris Dearden, Gary Devon Daniel, Dowling, Denise Ferran, Les Jones, James MacKeever, Jim Manley, Clement McAleer, Colin McGookin, Rosie McGurran, Gordon McKnight, Joanna Mules, Marcus Patton, John Sherlock, Mavis Thomson, Veronica Wallis, Paul Walls, Keith Wilson, Ross Wilson. Honorary Academicians: Brian Ferran, Harry Reid. Invited Artists: Karin Bamford, Christine Bowen, Paddy Campbell, Dorothy Cross, Robin Doherty, Emma Donaldson, Charles Harper, Brendan Jamison, Robert Janz, Joanna Karolini, Sharon Kelly, Anthony Luvera, Susan MacWilliam, Alice Maher, Julie McGowan, Stephen McKenna, PRH, Ima Pico, Gail Ritchie, Doris Rohr, Valentin Rothmaler, Nichola Russell, Amy Russell, Paul Seawright, Dermot Seymour, Gary Shaw, Jenifer Trouton. Also Selected Artists. The Gold Medal was awarded, and presented to Victor Sloan at the Exhibition Opening Reception on 18 September, by the Adjudicator Catherine Marshall, Collections Department of the Irish Museum of Modern Art and Visual Arts Touring and Collection Advisor to the Arts Council of Ireland. Victor Sloan: A solo exhibition at the Golden Thread Gallery, Belfast. History, Locality, Allegiance, a solo exhibition by the internationally renowned Victor Sloan, brings together a comprehensive selection of past works, with a particular focus on his lesser-known video works. This exhibition is a unique opportunity to re-examine Victor’s sustained investigation into his own personal history, aspects of protestant communities’ cultural traditions and a range of images now synonymous with Northern Ireland through the period of the ‘troubles’. 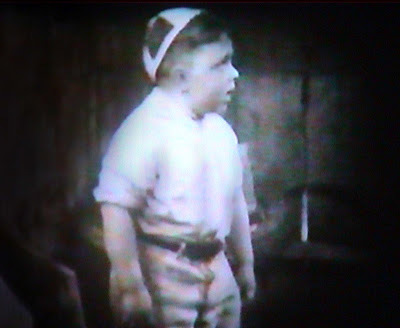 The exhibition features Little Rascals, one of the earliest examples of Victor’s video works, which embodies a similar set of formal qualities to that of the processes involved in his hand-worked photographic pieces. Walk and Drumcree, the two video projections on show, relate more readily and explicitly to the subjects central to his large photographic works from the 1980’s and 1990’s. 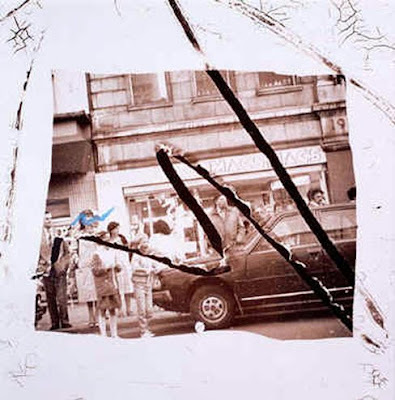 Alongside these video works we are showing a number of Victor’s key photographic works from the period, which again provide audiences with the opportunity to experience his ability to transform photographic images and create new narratives through his process of bleaching, dying, scratching and painting. Victor Sloan MBE is a Fellow of the Royal Society of Arts, a Fellow of the Royal Photographic Society and an academician of the Royal Ulster Academy. He has exhibited extensively in major exhibitions nationally and internationally and has work in numerous collections around the world including the Imperial War Museum; London; the Arts Council of Northern Ireland; the Ulster Museum, Belfast; Museum of International Contemporary Art, Salvador, Brazil; Sun Life Photography Collection; National Museum of Photography; Film and Television, Bradford (National Media Museum) and the Royal Ulster Academy of Arts. During the exhibition a selection of works are available for sale, with additional works hanging in the salesroom area of the gallery. Schools, colleges and tour groups are welcome – please contact Deirdre to organise a tour. Generously supported by Arts Council of Northern Ireland; Belfast City Council; Ardoyne Shankill Health Partnership and Robinson McIllwaine Architects. Victor Sloan’s works are included in the Imperial War Museum’s Breakthrough exhibition. Breakthrough is a major re-hang of the Imperial War Museum’s outstanding collection of British art. 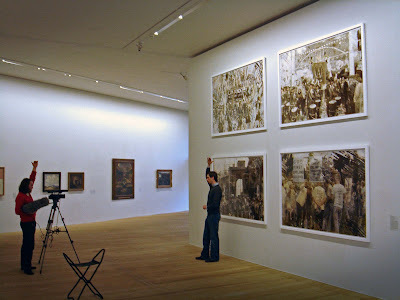 The display incorporates important artworks from the official art schemes of both world wars and significant non-official and contemporary works. The Government schemes selected some of the most avant-garde artists of the day to respond to war, and the Museum continues, in this tradition, to collect and commission the very best contemporary artists responding to current events. Among the items on display will be work by some of the most important British artists of the last century including Paul Nash, CRW Nevinson, Henry Moore, John Piper and Eric Ravilious, as well as a changing selection of contemporary works by artists such as Langlands and Bell, Colin Self, Victor Sloan, Jack Milroy and Bill Woodrow.